At the beginning of February I put together a four-pack of beers to get John Likes Beer through the remaining wintry days. While I had only intended for that pack to last me through February and February alone, but now it's nearly two weeks into March. It's in the sixties here in Cincinnati. Rainy, too. I'm calling it. I know we still, technically, have roughly a week left of winter, but who cares. Spring has sprung. The good news about that four-pack is that only three of the brews I threw into it were true winter-time offerings. 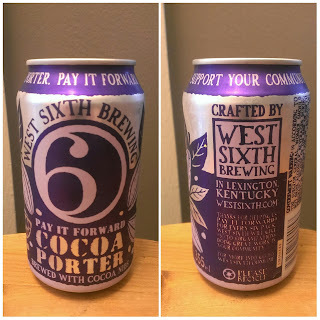 I had a hunch that the remaining one, West Sixth's Pay it Forward Cocoa Porter (henceforth in this post referred to as Pay it Forward), was one that could be enjoyed in the depths of snow or the burgeoning rains of spring. Here's hoping that hunch (or, at least, the enjoyed in the spring part of it) was right. The About Us page for West Sixth Brewing is my favorite kind: short and sweet. Let me relate it to you here: West Sixth, based out of Lexington, KY, was founded by four guys. Although they each took different paths to the company's founding, they all share common goals for the brewery. These are to have ever-changing taps in their taproom, to give back to their community and the environment, to and do their part in helping to create a sturdy beer culture in Lexington. See? Like I said, short and sweet. Pay it Forward plays into West Sixth doing its part for its community--50¢ from the profits of every six-pack is donated to a local non-profit (local to the community in which the beer was purchased, that is). Some of their distributers are matching this donation. West Sixth also buys their cocao nibs from Taza Chocolate. Check out the Pay it Forward webpage to see why this is important. Okay, okay, okay. I know what you're probably thinking now. "What about the porter itself? What does it offer?" Let me tell you what the brewery says. It's brewed with five malts, Cascade hops, and cocao nibs (as previously noted). What wasn't previously noted, however, is that each batch employs 60 pounds of cocao. Pay it Forward's ABV is 7%. It has rich notes of coffee and chocolate. It's mouthfeel is chewy-yet-smooth. For the full details, see the porter's webpage (linked above). What about what I say, you ask? Let's get the aroma out of the way first. It is an almost intoxicating wave of deep, dark chocolate notes. There's not much coffee there, but I don't miss it. This is, hands down, one of the best-smelling beers I have every encountered. I don't think cats enjoy the scent of chocolate. 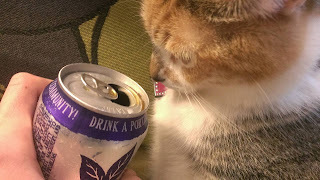 Purrl was only willing to give the porter three whiffs. The porter clearly isn't her thing. I find coffee and chocolate in the flavor, yes. But there's a lingering bitterness. This could be attributed to the malts used. It could also equally be attributed to the cocao nibs. But, if I was a betting man, I'd put my money on the idea that the bitterness was born of the hops. Pay it Forward has a nice taste, but it doesn't quite live up to the hype created by the aroma. West Sixth definitely has the description of the porter's mouthfeel down. Chewy? Check. Smooth? Check. End of story. A few summers ago, I whiled away a pleasant rainy day in Athens. Minus Purrl and Háma, I was alone in my apartment. I grabbed a glass and threw some ice in it. I took the two-liter of ginger ale from the fridge and filled the glass to the brim. I went into the bedroom, sprawled myself out on the bed, and nursed the ginger ale while reading a few chapters of JRR Tolkien's The Return of the King. All while listening to the rain batter the roof and the windows. It was the middle of the week, but it could have been a Sunday for all I knew. It was warm, lazy, and great. Maybe today's weather is playing into it, but that memory is what Pay it Forward conjures. Pay it Forward Cocoa Porter is the first West Sixth Brewing beer I've had. After my experience with it, you can bet I'll be on the hunt for more of their brews. Pay it Forward gets a sturdy 8.0/10 from me. At $1.65/can, it's priced perfectly. Oh, and my hunch was (at least) partly right. This is a good springtime brew.